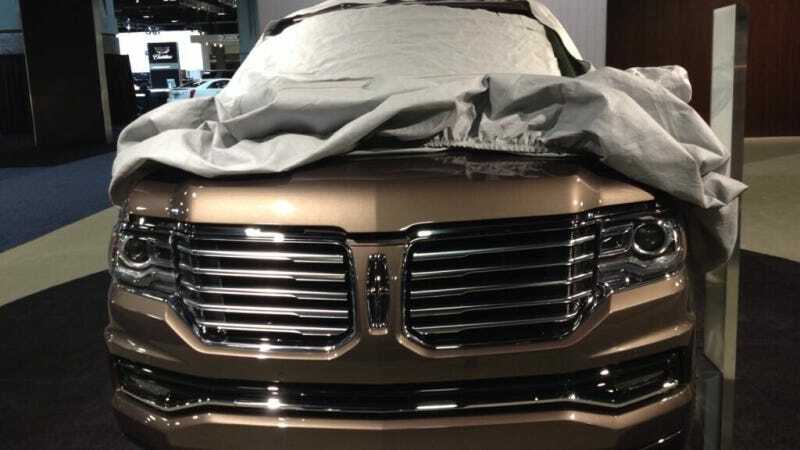 The 2015 Lincoln Navigator has a face like a freight train, but Ford hopes the new EcoBoost-powered full-size SUV will deal some damage to GM's recently redesigned Escalade and Yukon Denali when it goes on sale. Ford has been teasing shots of the new SUV on Instagram and planned to pull the cover off tomorrow, but those who were paying attention at the Washington Auto Show caught a glimpse early, including Clifford Atlyeh. In a press release leaked by FordInsideNews, the new truck is being described as a "fresh interpretation of the classic vehicle" and is confirmed to have Ford's 3.5 liter EcoBoost engine, Lincoln Drive Control with Continuously Controlled Damping, and electric power-assisted steering. Gadgets will include push-button start, SYNC with MyLincolnTouch, gorgeous leather that sure sounds like it's meant to be impressive, and puddle lamps for those who just can't bare to step into the dark. A "Reserve Package" will also be available with 22" wheels, even fancier leather, and Ziricote wood trim whatever that is. It's safe to guess a larger V8 will be on the options list. Guess we'll just have to hold our breath 'til tomorrow for the full 360 view, or at least keep our eyes on Twitter feeds from the Washington Auto Show.